THE 86 YEARS OF THE CHIQUI: A MULTICULTURAL, MULTIGERATIONAL AND TWO CUBAN LUNCH. 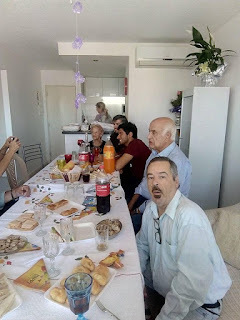 It was the 86th birthday of my brother's mother-in-law, whom we affectionately call "La Chiqui". It was her first birthday in Maldonado, a city near Punta del Este. The honoree was radiant, discreetly made up and with her affectionate style, serene and open to everyone. Her Daughter A ... served the table. All kinds of delicacies where there was no lack of roast pork and champagne and red wine.My Galician cousins were already born in Galicia, not Uruguayans. My brother and I like all good Cuban from the East, quiet or whispering in a low voice. Suddenly we were invaded by a Uruguayan family that came from Montevideo and here they monopolized the conversation. Speaks that speaks to you, of everything a little, they did not stop, like all good Uruguayan proud but with good intentions to unload their life, their works to survive, their desires. More relatives arrived, the last Italians emigrated since time immemorial who no longer knew of the Italian city where they had been born. And the Chiqui, trying to cheer up and please the phone by the multiple calls of congratulations and the kisses and gifts of the newcomers. My brother and I, the only Cubans present, remained silent. A man of about 56 years monopolized the conversation at the table, as if he were the only winner of the team. Until we receive an old man about 100 years old from the neighboring apartment. -"Would you like to sit down?" Said my sister-in-law. -Do not. I just came to congratulate Chiqui- said while sitting in an empty chair. The poor old man took pity on me and I sat next to him. - You are the Cuban? - He told me. "Yes," said my sister-in-law, "but there is also one who is his brother and has been in Uruguay for decades and is my husband. -Ahh I thought they were black because I have a son in Italy married to a Cuban black woman. -And have you noticed if the black Cuban does not dye her inner clothes with a black sweat or dark tint? The old man looked me up and down thinking if it was a joke or a hint of Racism. -Well, I do not know how to answer you. Only my son knows. The point is that the Spanish colonizers exterminated the native population: the Indians and only a few tribes remained in the most intricate of the mountains of Guantánamo: Charity of the Indians.Then came the Spanish colonizing emigration and other European countries. The percentage of whites was much higher than that of the black slaves that they brought from Africa and they reproduced like rabbits to the point of representing a large percentage of the Cuban people, especially in the provinces of Santiago de Cuba and Guantanamo. Then Fidel Castro came to power and he was in charge of exterminating by emigration to Miami a large proportion of the white race who knew that communism was not good for the soul or for the body.In the following years, the flow of whites abroad continued, of course, some blacks slipped into the stampede. The average of the black race that reached 60% in the country changed.When the misery of the Special Period came there was a massive emigration by sea, before Mariel had gone where the white majority that was left in the country, and so they were migrating to any country that welcomed them, as many remaining white as husky mulattos . There had already been an imbalance in the Cuban population, almost everyone was mestizo and currently do not make a marriage ceremony because it costs a lot in the Cuban way. Only Catholics and other Christian denominations continue with the old tradition of lifelong bonding in their churches. Now, everyone wants to get away from Communism with a more human mask. When I went to Cuba a few years ago to the family of the president of the improvised squadron-committee, she denounced my father and his children in an attempt to flee Castrismo through the US Naval Base near Guantánamo. They denounced us, they took prisoner my father and my brothers and I - the oldest was then 15 years old - tortured us psychologically in the State Security, in front of our father who could not hug us or talk to us. Well, those of the Committee that did not report had placed a "Cuenta Propistas" business in the corridor of their house, where they sold all kinds of things. A matter of adaptation to the new times of those who did not have some principles. And the population of Santiago de Cuba and Guantánamo was mostly black or mestizo, just waiting for a foreigner or family member from exile to give him a hand: Nike shoes, Levi's jeans or Adidas shams They had some principles.And the population of Santiago de Cuba and Guantánamo was mostly black or mestizo, just waiting for a foreigner or family member from exile to give him a hand: Nike shoes, Levi jeans or Adidas shawls. By the way, do you remember that Fidel pummeled against the capitalist transnationals of the first world? Well, he was the first one who in his convalescence of his great surgical operation appeared dressed in a sports suit with his name and the Adidas label. One detail that nobody commented, I noticed the Cuban news. Well, Fidel already knew that communism as he conceived it was a failure. His heirs, all white, are responsible for preserving his legacy with old phrases of the legendary leader, even without knowing that the town is already saturated with these and what they want is food: eggs, bread, flour, and everything essential to live, no luxuries but in their land, except that some beautiful mulatto or strong mulatto is tied with a foreigner and take it to Europe or Greenland, it does not matter, the question is to get out of that Cuban hell that is more and more like the Venezuelan. "And where were you born?" I asked. -I'm a citizen of the world. I've been around the globe, in Cuba when Batista and four years under the government of Fidel Castro. -And what did you work on? -Under the sea.- he responded with emphasis. - You are right. My job was to explore the Cuban coral reefs, the great coral wall of Australia and thus all the famous barriers in the world.I wanted to leave a great doubt that I have for years. -You know if in Cuba they continue to award at the annual Havana Film Festival with the "Black Coral Prize" even to film production technicians. -I dont know. I have not visited Cuba for some time, with the misery that exists, in addition, we have to take care of the coral of the world. We were not allowed to tear off a minimum piece of coral or the Great Barrier Reef of Australia. -But I've made investments in Bariloche, Argentina, in Italy, in Uruguay and now I'm thinking of investing in Miami, good for business. Have you seen the glass box full of toys where for a few coins a child is urged to grab a teddy bear? -"Yes!" We all said in unison. - Well, I invented that box long ago in Italy but my partner in this company died suddenly and without capital I had to leave it, another stole the idea and so he went all over the world. To all these the Uruguayan who spoke all the time had been cornered in his chair and remained silent. -Do you know what a Espeto Corrido is? - I asked to give me importance. -As not. If I have invested in Brazil too and I know the language. - Do you know that I tasted gnocchi to the Caruso that made me sing an aria from Puccini? - What aria? The Traviata? -Do not. The Tosca, Madame Butterfly, Manon Lescaut and other more of the Italian composer. All this, everyone remained silent, pending our conversation. - Are you really Cuban? Because it does not look like them, "he said. -"Your daughter-in-law has not learned from the rich Italian musical history?" I asked. -Do not. He has not even learned the Italian anthem we accept. I, look, I am a citizen of the world as I said. I visited the former Soviet Union when it was the communist empire, to Bulgaria, to Germany before and after the fall of the Wall and to Romania post Ceacescu. I have traveled the world on cruises or planes, I have nothing to visit. I am a born traveler, nowhere do I stay long. And now I'm going to Miami to continue with a company. -And what company is it? - Ask indiscreet. The old man did not respond. He kissed me on the face and another kissed Chiqui, greeted everyone present and went out the door to his apartment.We all fell silent for a few seconds. - Did not they hear your last name? Well, he is a charlatan Jew who is only waiting to live in Miami to protect himself from the cold of Uruguay. -He would be the Wandering Jew-and I said next -It is a poor old man who needs someone to listen in silence and knows that everyone is dazzled by a great businessman. They do not see that his fly was open. Not only knows how to take care to go to a birthday lunch. Anti-Semitism is obsolete. He is really a poor citizen who hopes to die in peace. "I said to justify my old delirious friend, it seems that everyone had believed the poor old man's fantasies.The final moment arrived. The women split around the Chiqui to talk about their latest operations-one had had a cholecystectomy for no less than a month and only ate cherry jelly, another how the fixed bicycle had lowered diabetes mellitus, another, the Older than 90 years old, I only looked at cell phones-especially mine-p- Did not they hear your last name? Well, he is a charlatan Jew who is only waiting to live in Miami to protect himself from the cold of Uruguay. "I said to justify my old delirious friend, it seems that everyone had believed the poor old man's fantasies. The final moment arrived. The women split around the Chiqui to talk about their latest operations-one had had a cholecystectomy for no less than a month and only ate cherry jelly, another how the fixed bicycle had lowered diabetes mellitus, another, the Older than 90 years old of Greece, she only looked at the cell phones-especially mine-to smile with her mouth painted a bright red and look good in the photos. That became a waiting room for a medical consultation. The only one who did not complain about anything was the sweet and good la Chiqui. The two young people only began to intervene when everyone talked about their car, brands, speeds and all that roll. I asked quietly, already attached to the male corner, that where was the Red Zone of Maldonado? To get whores. Only the young people responded and recommended various places and prices.I had only drunk soda without any alcohol. - Pe... my cousin, I could not drive to Montevideo at night so what would go to my brother's house, in front of Playa Brava. I was left with a concern because the conservationist and ecological spirit had risen: the Black Coral trophy will still be given in Cuba at the Film Festival. Could someone investigate me that?